Fair City I.T. Solutions will take most computer equipment any age and in any condition. Our aim is to reduce the amount of computer equipment going to landfill each year by recycling as much as possible. All most every computer that is scrapped personal / business information is left on the hard drive. With identity theft consistently on the rise any equipment we are given will be specially wiped so no data can be recovered. We will collect from Home's in Perth at no charge. If you are out width of Perth a small charge will apply. 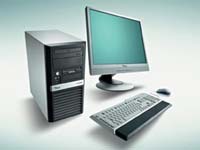 Recycling of Business computers may incur a charge depending on amount due to disposal costs. If requested we can supply a certificate which guaranties your data has been completely wiped. If you have any questions please give us a call.